Hi Vaughn, how’s your summer been? You always sound as if everything’s on the up, ever more exciting! Hi Janice! I am pretty much always “on the up.” Mostly due to attitude, which I believe is 93% of EVERYTHING. Look for an upcoming blog post about the down times I (and everyone else) experience and how we handle them. Thanks for the support and comments! I really needed this post. Seeing the time calculated out mathematically makes it easier to wrap my brain around. I have a few outlines – non-fiction is my genre, and none of them are going very far. It is easy to get all tangled up in words. Your ideas have inspired me and I can’t wait to check out more of your inkslinger section. Seeing that you are HIV positive makes me have even more admiration for you. I was diagnosed with HCV 3 years ago and finished treatment with success. Unfortunately, I was left with non-alcoholic End Stage Cirrhosis. My mental fatigue slows me down a bit. Your attitude matches mine in that I know anything is possible when we have possibility thinking. I believe finishing a book is possible! All my best wishes to you on your continued success. It’s great to read your inspirational comment! Thank you so much for the kind words and for sharing. 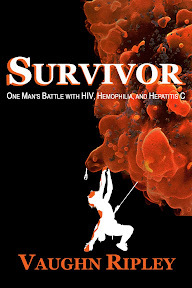 I had Hep C too, and was able to beat it about nine years ago. That was literally ten months of a living hell (as I’m sure you know). However, it is so cool to have beaten it. I have many hemophiliac brothers who are not able to beat for various reasons and HCV is killing some of us off. Write your book! And then please share so I can read it! Keep up the inspiration and positivity!! !